Between the winemaking team and the always visiting chefs or sommeliers, there is usually a fair amount of talent hanging around the winery at Norm Hardie's, but yesterday was a bit extraordinary. 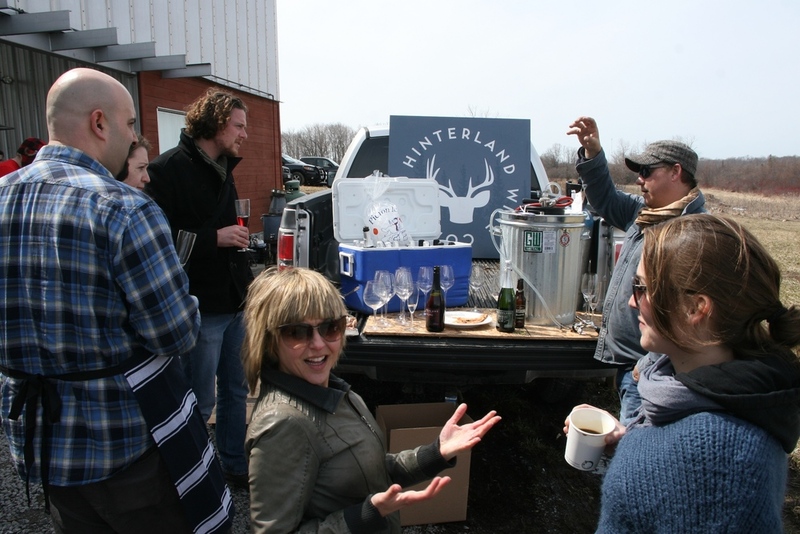 Most of the chefs, winemakers, speakers and organizers from Monday's annual Terroir Symposium descended upon Prince Edward County for a kind of day-after party, a hedonistic afternoon of culinary collaboration. Terroir is an annual hospitality industry conference organized by Arlene Stein. A huge amount of work goes into organizing this one day event, and Arlene has done and outstanding job collecting many of the world's top names in hospitality to attend and contribute over the past few years...most of which arrived at Norm's yesterday for some extra fun, Prince Edward County styles. Notably absent at lunch was Terroir keynote speaker René Redzepi, chef/owner of Noma in Copnhagen, but the culinary firepower wasn't at all weakened as top chefs from all over North America and Europe all pitched in for a feast. Guests included former Gold Medal Plates champion Mark Lepine from L’atelier in Ottawa; Jeremy Charles, Raymonds, Nfld; Connie De Sousa & John Jackson, Charcut, Calgary; JP McMahon, Aniar Restaurant, Galway, Ireland; Magnus Nilsson, Executive Chef, Faviken, Jarpen, Sweden; Kobe Desramaults, In de Wulf, Dranouter, Belgium; Scott Vivian, Beast Restaurant; Mathew Matheson, Parts & Labour amongst many more. Barrel tasting before the lunch gets started. 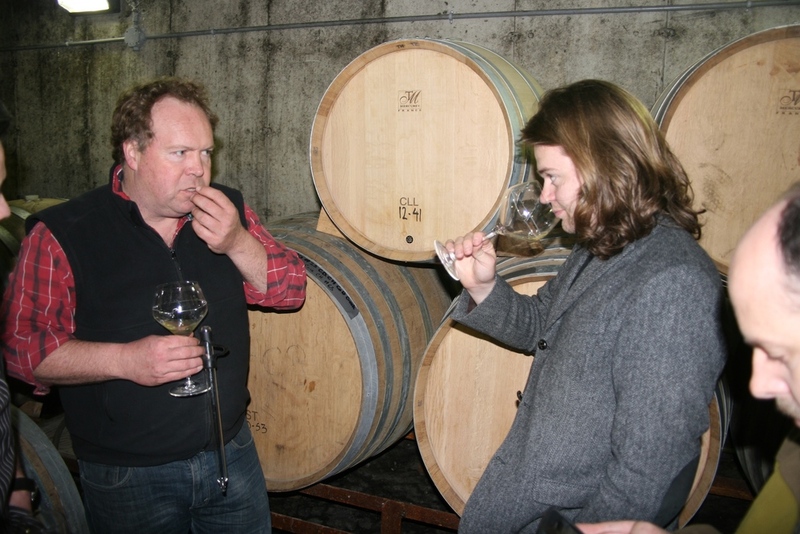 Norm tasting some County Chardonnay from barrel with Magnus Nilsson from Faviken, Sweeden. Some Ottawa love at the fire! Boiling down some sap for maple syrup is former Ottawa Whalesbone Chef Charlotte Langley, former Gold Medal Plates champ Marc Lepine of Atelier, and current Gold Medal Plates champ Jamie Stunt of OZ Cafe. Charlotte Langley is Fear and Loathing in Prince Edward County. Only magnums for this party. Any questions? Didn't think so. Stephen Beckta tasting some tasty seal meat from Newfoundland. With a menu this big, you need the whole length of the table. JP McMahon, from Aniar Restaurant, Ireland. Me and Magnus Nilsson of Fäviken crushing JP McMahon's pork belly with Norm's County Chardonnay. Pizza ovens aren't only for pizza. Ottawa's Stephen Beckta and Mark Lepine love crab legs! Chefs cheffing away in the winery's fully equipped kitchen. Johannes' homemade sausages on the grill. Norm kicking of the feasting with a little chat about how we do in Prince Edward County!